In my last post I reminisced about my childhood fascination with aquatic turtles. As a young hobbyist and amateur naturalist I had amassed a collection of these shelled reptiles to the dismay of my parents. Back then it seemed that with every coming year, I needed a bigger tank or pool to house my assortment of ancient, cold-blooded beasts–contemporaries of the dinosaurs. Some grew, but some certainly arrived larger than those existing residents who first made my house their home in previous years. I’d like to think that I had created an educational exhibit for the neighbors as opposed to just a growing menagerie of wet herpetiles. I now am much more cognizant of the impact the pet trade has on freshwater turtle conservation. Whether one is depleting wild populations or expanding the range of common species through introducing captive-born animals to the wild–the impact takes its toll. In my previous post I somehow failed to mention one of the iconic conservationists who inspired my passion for herpetology and my novice attempt to curate of a collection of select herpetofuana. Dr. Archie Carr was a naturalist, an iconic conservationist, and a highly esteemed herpetologist. His book So Excellent a Fishe: A Natural History of Sea Turtles introduced me to some of the most majestic creatures I have ever learned about–marine turtles. They are quite different from their fresh and brackish water cousins and perhaps a bit more graceful in the water. I’m quite certain that I had seen a sea turtle in captivity prior to reading the book. Unfortunately, such a captive ambassadors commonly viewed in public–as important as they are–tell only a snapshot of the life history of these chelonians. ﻿All 7 marine turtle species are threatened. The bulk of these threats are human-induced from pollution to loss of habitat. In fact, only a few large nesting sites for some of the species exist today. The hawksbill, green and loggerhead turtles comprise those with particularly marginal nesting grounds of good size. However, all marine turtles are recognized internationally as a species of conservation concern and thanks to some dedicated organizations efforts to save these turtles are making a difference. I’d like to celebrate the 25th anniversary of the Jumby Bay Hawksbill Project, the longest running hawksbill sea turtle research program in the world. Supported by the Jumby Bay Island Company, the conservation project is embraced by indigenous people and visitors to the private island off Antigua’s coast. Antigua, itself, is an island in the West Indies. I first learned about this project through the organization’s former Field Project Director, Seth Stapleton. Seth continues to work with the organization, but has gone on to study another pelagic, marine species–the polar bear–for his PhD. 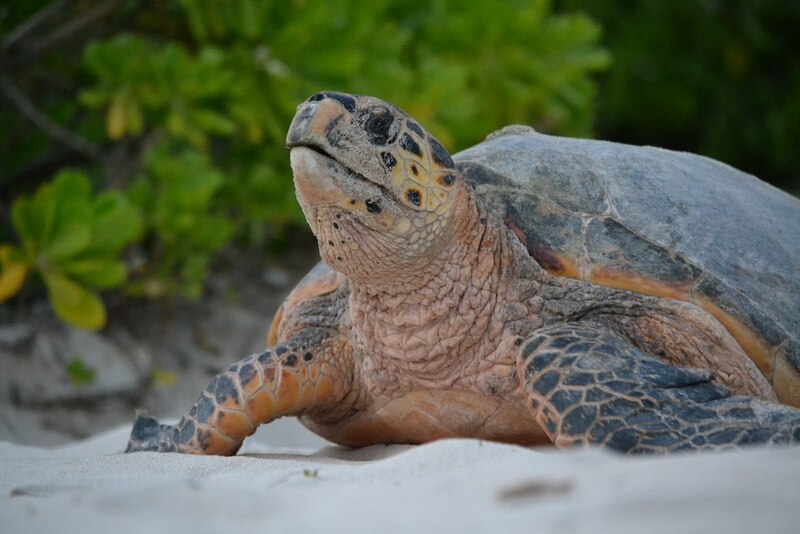 It is on Pasture Beach, a 450 meter stretch of calcareous sand, that Seth and his colleagues return to each June to monitor hawksbill turtle nesting activity. The team patrols the beach between dusk and dawn–the only period of time when the hawksbills nest.